Father Sean Loomis of the Deaf Apostolate of the Archdiocese of Philadelphia. Peter McLaughlin is an extraordinary deaf man with a remarkable story. As a deaf man in a hearing world, he relies heavily on sign language to foster meaningful relationships, particularly in the deaf community. Over the course of 23 years he worked climbing and trimming trees, ever a source of pride and always without incident. Nevertheless, despite the danger at work, his accident happened at home when, leaving his workbench, he tripped over his beagle he never heard sit behind him. The fall broke his C4 and C5 vertebrae, leaving him paralyzed from the waist down and without function of his fingers. As a result, at the young age of 43, Peter’s life changed permanently, including the loss of his ability to sign. For 13 years he’s lived in a Medicare-sponsored nursing home, relying daily on nurses and staff to care for his needs both personal and medical, including services as small as brushing his teeth. Now 57 years of age, Peter, without family to visit him, is the only deaf man in a facility where not a single resident communicates in sign language. As the chaplain for the Deaf Apostolate of the Archdiocese, which provides pastoral care, sacramental preparation, religious education, faith formation and a regular schedule of Masses in American Sign Language for those who are deaf or hard of hearing, I have come to know Peter through this mission of the church. Over the last nine years I’ve known him — in assisting him at Mass, enjoying social conversations and visiting him in the hospital — Peter never complained about his circumstances. Not one single time. He remains ever a man of joy, grateful for the blessings that pepper his every day, and docile to the ebbs and flows of life. 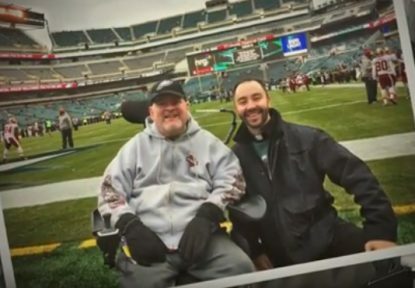 Peter McLaughlin, left, enjoys the view from the end zone of Lincoln Financial Field in Philadelphia, along with Father Sean Loomis, before the Dec. 11 Eagles game against the Washington Redskins. He is a faithful Catholic, attends Mass with devotion at his nursing facility (which I interpret for him), and suffers patiently the misfortunes of life with the great expectation that God will bless him in the life to come. He inspires me to appreciate God’s blessings similarly in my life and especially to find meaning in the cross. There is, however, one detail about Peter’s life that likewise stands out: Peter is majorly addicted to Philadelphia sports, including the Phillies, the Flyers and of course, the Philadelphia Eagles. He speaks often of them, knows every player, recognizes all the coaches and knows statistics. He wears his Eagles sweatshirt regularly and perseveres in loyalty through good times and bad. But surprisingly Peter had never attended an Eagles game in his life. All of that changed on Sunday, Dec. 11 when Peter attended his first Eagles game (against the Washington Redskins). Thanks to the generosity of so many people including the staff of Lincoln Financial Field, team president Don Smolenski and the players, who gave Peter an original NFL game ball, Peter met several of the heroes that offer joy to his life. The brief video below shows how the Deaf Apostolate was able to assist one of God’s greatest in seeing his dreams come true. 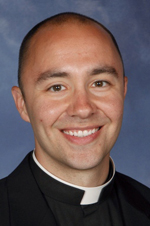 Father Sean Loomis is in ministry with the Deaf Apostolate of the Archdiocese of Philadelphia and serves as parochial vicar at the Cathedral Basilica of SS. Peter and Paul, Philadelphia. NEXT: Do Catholics stand with Standing Rock? I an a long time friend of Peter played rugby together. .article bought me to tears. Father feel free to contact me we can maybe do an outing with Peter.